KFC Customer Anonymously Sends in $2, Apologizes For "Stealing"
A KFC customer in North Platte, Nebraska recently felt so guilty over "stealing" a piece of chicken that she felt compelled to apologize and send in $2 to pay for it. You're probably wondering why I keep putting stealing in quotation marks. That's the funny thing here: the woman appears to have suffered an attack of conscience for a crime she didn't actually commit. She took more pieces of chicken from the buffet than she could eat (KFC has buffets now? ), and when it came to the last one, she realized she couldn't finish it and didn't want to see it thrown away, so she put it in her purse and took it home. That's it. That's the whole story. There's your Great 2014 Poultry Heist. "It seems as if her conscience got the best of her," Rasmussen said. "There was no return address on the envelope. I really wish I knew who it was. I would buy them a few meals." The article does not that some people take advantage of the buffet by only paying for one plate for a full family or by trying to take the entire last plate home, which are both pretty cheap, tacky things to do. Still, it's obvious that's not what happened here, and you'd have to be pretty Draconian to think the anonymous woman's behavior constitutes theft. Good for her for having that strong of a moral compass, but she still didn't do anything wrong in the first place. "This $2 is for the piece of chicken I brought home with me on Tuesday. That's stealing. Sorry! I took more on my plate than I could eat and I knew it would get thrown away there because it couldn't get put back on the buffet so I put it in my purse and brought it home. I do love your chicken! Anyway, God has forgiven me and I hope you will too. I will not be so quick to take so much next time." 1) Given that this lady "loves" KFC, it's pretty clear she's only loosely-connected to reality. No one loves KFC. 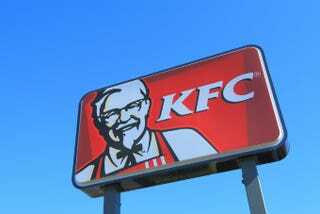 KFC shareholders don't love KFC. KFC is what you settle for when Popeye's is closed AND they've put a padlock on their dumpster. 2) Not that I think God was particularly pissed off with her to begin with, but how does she know God has forgiven her? Did a light shine from the sky and a voice boom down saying, "Verily, Kimberly or whatever your actual name is, we art totally cool on thine chicken pilfering"? I feel like this is an important question. Spiritual conundrums aside, I'm glad this woman will sleep easy tonight.